What is Temple Sponsored Housing? Given the limited availability of on-campus, traditional housing, University Housing and Residential Life may enter into agreements with properties adjacent to campus that offer many of the same amenities and features that are traditional on-campus residence halls offer. University Housing and Residential Life has partnered with Beech International Village complex to offer additional beds for its on-campus population. Heat and A/C are controlled by individual units. Important: Low temperatues can cause pipes to freeze and burst. Avoid this by keeping windows closed and the heat on low at all times during the winter months. You are issued a laundry card at the beginning of the year. You can load cash onto the card using a machine in the lobby. The laundry machines only use this card and do not take any other form of payment. Note that failure to return your laundry card when you check out will result in a fee. Report maintenance issues by calling 1-800-223-1376. Provide the location (hall), floor, and the machine number. The length of time it takes for you to receive a package depends on the carrier. Some carriers, such as UPS, deliver to a central location on campus. Packages are then sorted and transported to individual halls within 2-3 business days. Other carriers, such as Amazon, deliver directly to each hall, reducing the length of time it takes for packages to arrive in-hall and be processed by front desk staff. You can pick up your packages at the front desk. 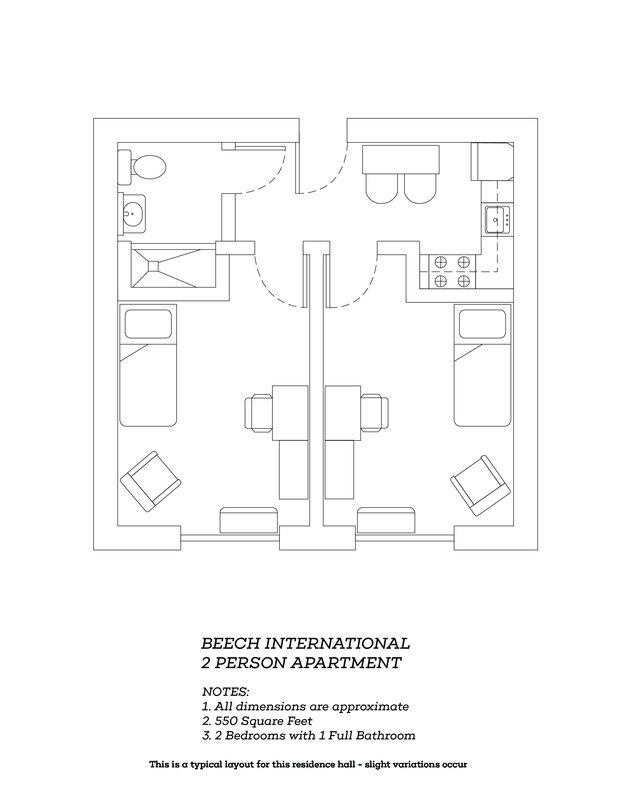 Beech provides 24/7 security monitored access and Resident Assistants on each floor. Residents live in single bedrooms in a 2-person unit with a common bathroom and kitchenette.